I bought it June 22, 2012. For a reason I can't tell you yet, I decided to get it ready to be used for Thanksgiving. It was REALLY REALLY dirty. So I started stripping it. First I vacuumed it like 30 times. Still, as I removed the upholstery it shed sandy grit all over the drop cloth I had underneath it. 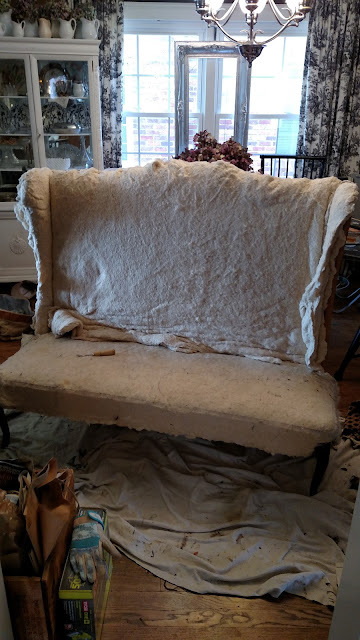 It had approximately 7,623,419 staples and tacks in it..
Could I just say that IF you get brave enough to remove upholstery from something like this, invest in the proper tools to remove the upholstery. Yes. You can use a flat head screwdriver and needle nosed pliers. If you do this you will get at least 5 larger blisters, and then blisters on top of those. For less than $20 you can get a staple remover and heavy duty tack remover that combined with a pair of gloves will save your hands mightily. Since this settee is going to be used at the dining room table I think that slip covers are the way to go here. I want to be able to clean the cover. But the whole thing needed to be upholstered to cover up the creepy insides. I decided that it wasn't so creepy that I wanted to replace all of the batting. I just covered it up with another layer of batting. 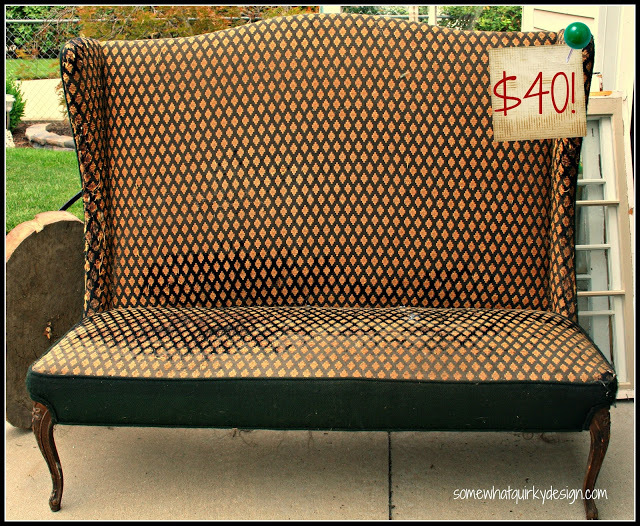 Then I "upholstered" the whole thing in duck canvas. I say "upholstered" because the job is NOT fine upholstery. 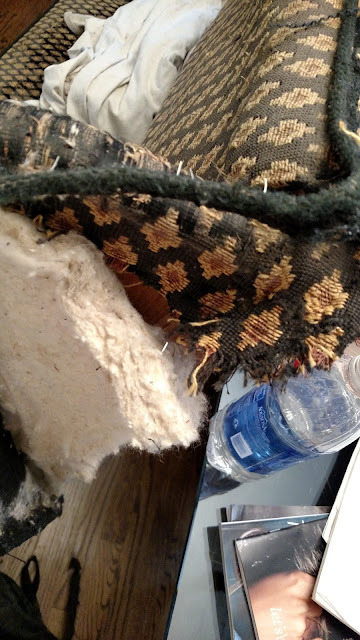 Probably not even good upholstery. Lots of mistakes were made. And although I caved and went ahead and bought this to help with the stapling, I think I will have to invest in a couple of other upholstery tools before I start work on a few of the other pieces in my garage. Now I'll be going because I have a slipcover to get made and photographed before Friday. Hey! Your tack lifter looks like my weeding tool - so much so, I had to look up my weeding tool to make sure I haven't been using a tack lifter in the garden. Either one would work great for digging up stubborn vines in the garden that grow wild and try to strangle plants. Can't wait to see the reveal. Wow. The original upholstery would fit into my decor perfectly. Too bad it had cat damage and was so dirty. I'll be interested in seeing what you did with it. I love the piece.